Luke completed four very successful years at Wildground Junior School in Dibden Purlieu and this September he moved on to mainstream Secondary school. He was very happy at junior school and achieved many things while he was there, during all of his time there he was fully included in all of the school life. In years, 5 and 6 Luke would occasionally become upset when he noticed that he was not doing the same work as the rest of the class. On one particular occasion in year 5 the class were given a science test, they had to watch a video and then tick 'yes' and 'no' answers on a sheet of paper to do with what they had watched. Luke made it clear that he wanted to do the test along with his class, something that to begin with his teacher thought he wouldn't be able to do. When the tests were marked Luke had come second in the whole class (copying the boy next to him had been ruled out as he had only got two questions right). Luke's teacher and LSA admitted afterwards that they were totally gob smacked! Over the years, I can recall many funny instances while Luke was at the Junior school. He told his year 3 teacher, when she put a religious studies video on for the class to watch, that he wanted to watch Shrek! 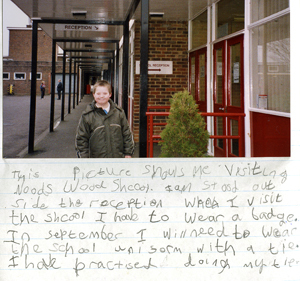 We made it known when Luke was in year 5 that we wished him to follow his older brother and sister onto Noadswood Secondary school in Dibden Purlieu and to remain in mainstream education. Noadswood, like Wildground Infant and Junior school, had never before had a child with Down syndrome at the school, but we were never made to feel that it would be a problem. In November 2004, nine months before Luke was due to transfer schools, Noadswood and the Junior school drew up a transition plan of visits for Luke. I was given a copy of this and every two weeks Luke would make a short visit to Noadswood to begin to familiarise himself with the school, to meet his LSAs and his Head of Year and for them to meet and get to know Luke. Thanks to the hard work and communication of everyone involved, Luke has had a problem free transfer and is already able to negotiate his way around a large secondary school. On his very first day at Noadswood he had a Design Technology lesson; when I asked him what he had done in the lesson he told me that he had sawed some wood, then he carried on and told me that he had made a chair and a rabbit hutch! He told a prefect one day that he had no lunch, which was a lie, and the prefect gave him some money to buy chips. We told him off at home about this and I don't think he has done it since. I put two lots of sandwiches in now, some to eat at break time and some to eat at lunchtime. The most important thing for us is that Luke has always been happy at school and continues to be happy. 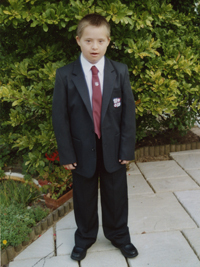 All three schools he has attended had previously had no experience of Down syndrome, but Luke has been welcomed into each school and has achieved much in his schooling. Sadly I have friends who have not had the positive experience we have enjoyed. If anyone wants an example of inclusion working well they need look no further than the three schools that Luke has attended. We realise that the gap educationally between Luke and his peers widens all the time, but it has always been our wish that Luke be included in mainstream to better prepare him for the time when he has to go out in to the wider world and hopefully he will be better prepared with the life skills that he will need for that.